Crews extinguish a fire on the eastern span of the Bay Bridge on Wednesday, July 15, 2015. 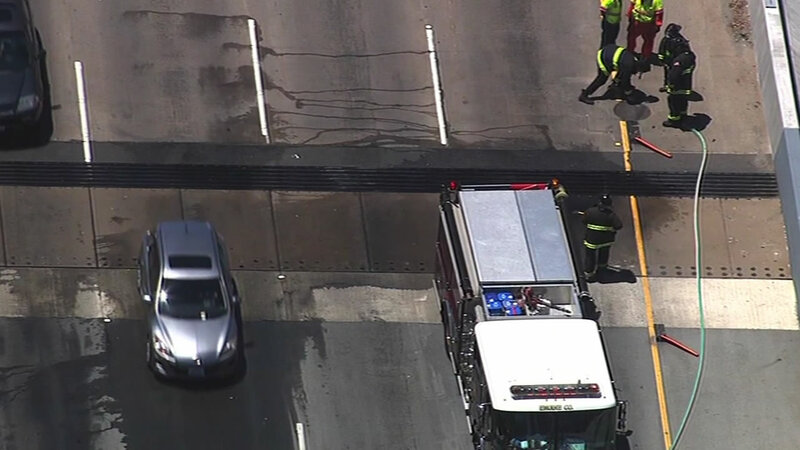 SAN FRANCISCO (KGO) -- Officials say warning flares put down by maintenance crews may not be the cause of two small fires on the Bay Bridge after all. Caltrans spokeswoman Leah Robinson-Leach said the fires happened in the bridge's far left eastbound lane just past Yerba Buena tunnel - one on Monday night and one at midday Wednesday. She also released a statement saying: "In light of the fires, we are reviewing flare operations and directing crews to start their work away from bridge joints. We are also looking to increase CHP presence during our operations on the bridge." Both fires burned several feet of rubber covering the joints that link sections of roadway. According to Caltrans Wednesday's fire was likely caused by a road flare put down by maintenance crew, but Monday's fire is still under investigation. No one was injured in either fire, but they slowed traffic while firefighters worked to put them out.